Hello! I am one of your blog readers! You are so talented and every time I see photos of your work I fall in LOVE! :) We are expecting our second baby! It's a girl!!! I'm due in about 6 weeks and I'm way behind on her room and wondering if you could help me. I need inspiration! I'm sort of stuck and having a hard time with the "vision". Our house is around 100 years old. It's a great home full of character. All original wood work and wood floors. I love all things old and eclectic. I would say my "style" is farm house/shabby chic. I just love designing children's rooms and nurseries in particular, because I can let myself imagine!! And I was particularly excited to help Danna because she already has a great start. Here is the bedding Danna has chosen for the nursery...Delilah by Cocalo Couture. It's absolutely fabulous!! I just love the fact that it's not "traditional girly". No pink here folks. Don't get me wrong...I love pink for a baby girl's room...but I love a mom who isn't afraid of brown and blue in a baby girl's room! 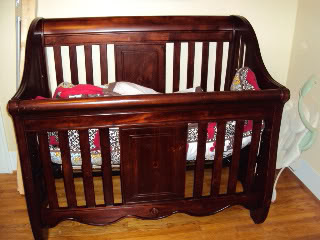 Danna also has a gorgeous cherry crib and changing table, red accents and warm gold walls. Danna needs help finding a lamp, a chandelier and a rug. She also wants a little bit of advice on what to do with some of her existing accessories. 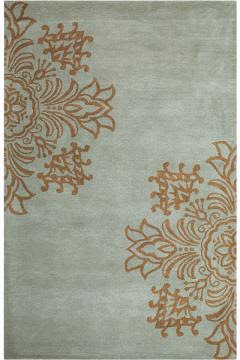 This rug plays off of the damask/geometric feeling of the bedding with a bold oversized motif. If Danna wants something a little more understated, the Grimsby Rug by Home Decorators($199 for a 4x6) does the same thing, in the same color story, but on a smaller scale. 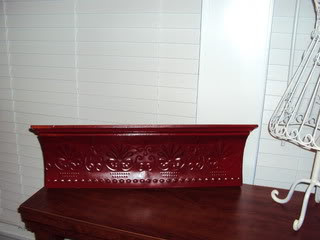 I would pair this base with a plane white barrel shade (easy to find at your local Tar-jay). I included this first choice because Danna mentioned that she liked a Shabby Chic aesthetic. 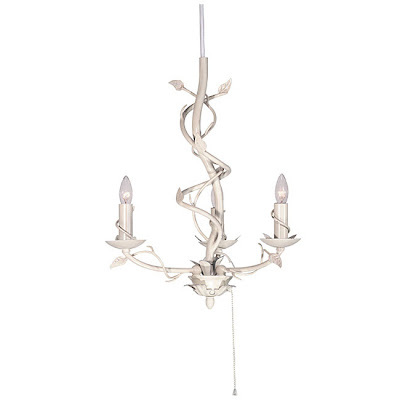 This is a mini chandelier (29.99) so it is quite small, but the cream color would play nicely off the lamp base, and would contrast with the darker walls and bedding. Second choice chrome and crystal (86.99). This choice is over-the-top bling. I love it. 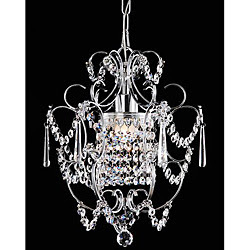 I think it would really create a girly statement of its own among the rest of the color choices going in the room. 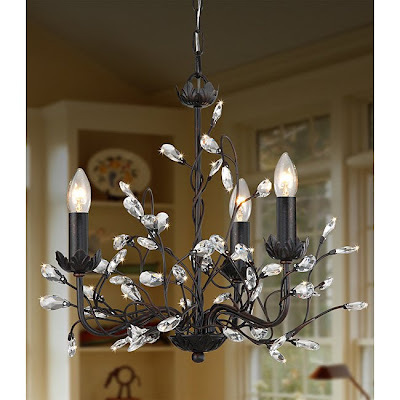 Finally, to go along with the bird theme...this iron and crystal chandelier that reminds me of branches or twigs. (133.99). It would still add the bling, but in a more understated way, and the darker iron would blend with the brown in the bedding. 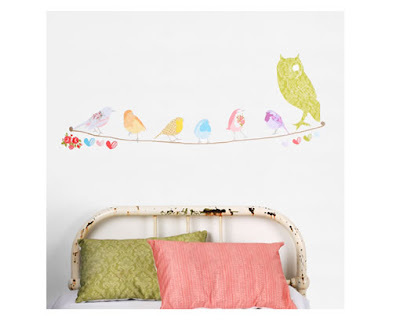 For a little bit of whimsy, I suggest these wonderful re-usable fabric wall decals from Mae. This set called Twitter for Girls (44.95) adds to the bird theme and would be perfect art above a crib or changing table. Danna wanted to get a birdcage to go along with the bird theme. I say definitely....and for a soft glow, fill it with twinkle lights...a perfect light to snuggle a tired baby in the middle of the night. I would suggest running a single wire from side to side across the frame and then hanging the baby's christening gown (or a vintage gown of Danna's or Grandma's) on a pretty hanger from the wire. 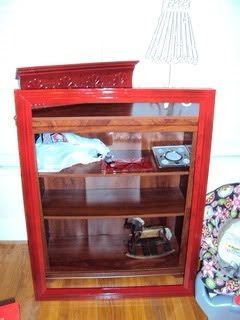 Danna also had these two red shelves she wasn't sure if she should use. I say, "use them!" I would hang both shelves near (not over) the changing table and use them for storage. 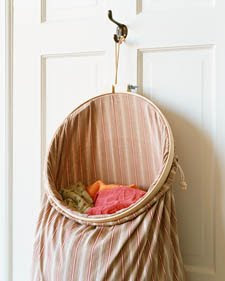 On the longer shelf, find a pretty basket or other container to hold a few spare diapers or other changing needs. Well, Danna, I sure hope these ideas help!! Please send photos when your nursery is all done! Beginning next Friday, I'll be bringing back my Frugal Friday Linky Party! I'd love to turn this into a weekly event. What do you all think? Yes or no? Please weigh-in on your thoughts in the comments section!! THANKS! You have given her some wonderful advice! That nursery is going to be so pretty! I am with you on the non-traditional color choices. Like that! That nursery is going to be beautiful! I love her bedding choice. I want that second blingy chandelier for me! 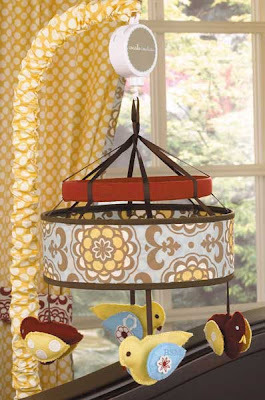 I love the branch lamp and the fabric decals. I love Mae's Forest Critters collection and may have to try that for my daughter's room. We are doing green walls with pink accessories. I like pink, but the idea of all pink walls overwhelms me. Thanks for sharing those ideas. Great choices that will make a lovely nursery. I love those chandeliers. 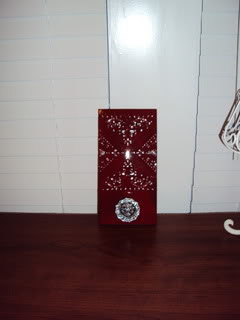 I've been wanting to replace my girls' boring white ceiling fan something more sparkly! Thanks for the inspiration! Happy Friday! She came to the right person!!! you came up with amazing suggestions... love the twig lamp bases!!!! And the decal such a sweet additions!! All your suggestions were fabulous! Love all 3 chandeliers. That would be a hard choice for me! The bedding she chose is gorgeous! It will no doubt be an unbelievably beautiful baby girl nursery! I love everything especially that second rug. Gorgeous!!!! I hope we get to see photos of the finished space. :) And I say YESSSSS on Frugal Friday! Wow, great advice! 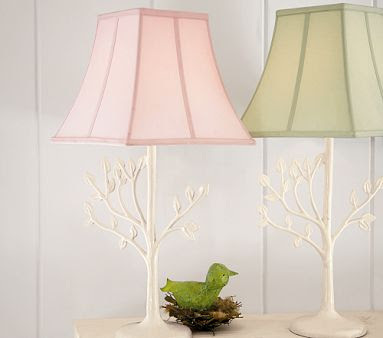 I too did a bird themed room and it was hard to accessorize but these are wonderful ideas, especially the chandeliers. I might use the embroidery hoop-pillow case hamper idea myself! If you find time, could you lend me some advice on how to decorate my living room console table? I am stumped as to what to do next. Thanks! I love your ideas, your blog is so much fun to read! I vote YES for frugal fridays! I miss all the great ideas! Your choices for the nursery are beautiful! I agree that she has chosen a wonderful color theme! Wow! I might be emailing you! It is going to be a nursery that puts all other nurserys to shame! What fun ideas! I love decorating nurseries too. Wendy, I just posted a tutorial for my variation on your "words and wire" book wreath. I linked to you and included a photo of your wreath in my post. I hope that's OK! the nursery is going to be beautiful! 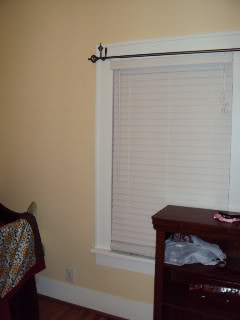 Love the non tradition baby room colors! You are amazing! Thank you! I LOVE all the choices! Thank you again for your help. We are working hard to have her room complete by the end of the month. I'll share pictures when done!